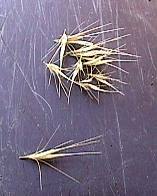 A serious hazard for field dogs, or any dogs in the field, are the hard seed-bearing structures of some kinds of grasses, often called "foxtails". These structures have sharp points at one end, and microscopic barbs, so that they easily move in the direction of the point, but not the other way. They "work in", but they don't "work out". They can become imbedded in the hair, especially the paws and ears, and in nostrils and even eyes. As they work their way in, they cause infection, and if not treated can sometimes be fatal. Southern California has a number of different grasses with this nasty feature, most of them originally from Mediterranean Europe, and most of them common. 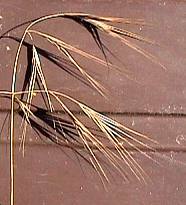 The purpose of this web page is to help you identify some of the most common of these grasses in southern California. The same species are found in other parts of the Southwest, and similar species are found across North America, although sometimes with different common names. 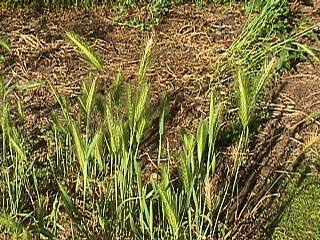 The most troublesome grass is the actual "foxtail" or "wild barley" (Hordeum murinum). The individual reproductive structures are small and easy to overlook. This grass is common in weedy areas around roads, paths, and other disturbances. It is an annual, and is soft and green from January through March or April. As the seed heads dry in the late spring, they become dangerous, and they stay that way throughout the summer and early fall. Here are some closeups. Several other grasses can cause problems, too (like foxtail, they are all annuals, and worst in the late spring and summer). The one with the nastiest name is ripgut grass (Bromus diandrus, left); it actually perforates the guts of cattle when they eat it, and can easily kill a dog, but it is much larger than foxtail and easier to see in the coat. Ripgut grass is common on grassy hillsides, but not common in disturbed areas. Cheatgrass (Bromus tectorum, not shown) is similar to ripgut, but smaller, and is common on grassy hillsides in desert areas such as Palmdale or Victorville. Red brome (Bromus madritensis, right), like foxtail, is common along paths and roads. It is often confused with foxtail and is almost as much of a problem. Some California native grasses, especially the needlegrasses, can cause problems for dogs as well, but they are much less common. This page and all photographs copyright © 1998 by Curtis Clark. Paper copies may be freely distributed as long as they include this notice. Last revision Sunday, June 14, 1998.